It was a Saturday night, and my husband was working until midnight. If I could just get the kids to bed at 9:00, I’d have three hours to myself, I thought. But that was not in their plan! They were going to milk every last hour out of their time. My son finally went to bed around 10pm, but Little Miss Sunshine was just not going to do it. I had read stories, tucked her in, made trips for snacks, tucked her in, found her special pillow, TUCKED HER IN! Nothing. She was wide-awake. Finally, I gave up. “You can play quietly while I go in my room, and just get me when you need me,” I said. 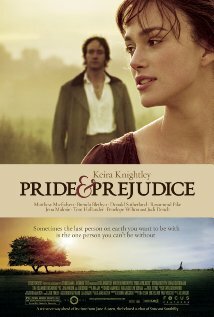 So, I tucked myself in with hot cup of tea and Pride and Prejudice (Keira Knightley version). Tip tap tip tap, she came into the room about a half hour later. “I need– wait, what are you watching?” she asked. Figuring it was too late to say “uh, nothing” I told her I was watching Pride and Prejudice. “ I love that movie!” she said, “I’ll be right back.” In the time it took me to contemplate what is so universally appealing even to a 5 year old at the time about Mr. Darcy, she was back with pillow and blanket. As we watched the movie I realized that alone time is sometimes even better when I’m snuggling with my freshly bathed little beauty in her new silk pajamas and her chilly little feet pressed up against mine! That’s true, and sometimes it’s much too rare!